After the Sack of Rome in 410 and the successful Barbarian campaigns, enamelling in Western Europe acquired an Eastern style with a lower technological quality. The artisans filled the cells with coloured glass similar to enamel, but not so perfectly adhering to the metal base and thus imperfectly called enamel. An exception is represented by the British islands from the 6th to the 8th century, undisturbed by the Barbarian invasions, where we can find a renewed interest in Celtic and British-Roman art. 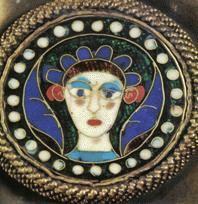 The Anglo-Saxons learnt this technique and developed it through their goldsmithing art into a new style of insular cloisonné enamel decoration. Complex figures will not appear before the end of the 8th century. 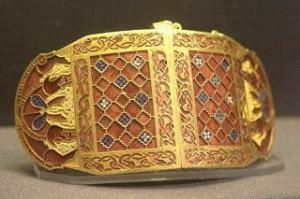 A noteworthy example of this art is the Sutton Hoo burial ship (England, 7th century), where the excavations have made it possible to find wonderful gold filigree and cloisonné works decorated with red garnet and, more importantly, Roman millefiori glass re-used as enamel, mainly for the blue decorations. 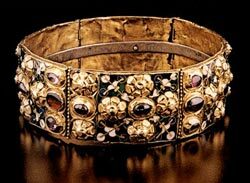 One of the most important objects left by the German peoples in Italy is the famous Iron Crown, created and perfected in more steps by the Ostrogoth, the Lombards and the Franks between 400 and 800 AD. The analysis by the University of Milan have demonstrated that the traditional history of this precious object is for the most part correct. According to both tradition and science, in fact, the gold of the Iron Crown comes from an earlier 4th century diadem (the presumed original owner was Constantine the Great, 272 – 337 AD), while the original plates enamelled with a potash-based glass are a later addition under the reign of Theodoric the Great (454 – 526 AD). The Crown probably underwent a series of minor restorations under the Lombards, until Charlemagne had 21 out 24 enamels replaced with new soda-based enamels on occasion of his coronation on 25 December 800. Since then, up to 32 kings and emperors wore the Iron Crown – the most important was probably Napoleon Bonaparte on December 2, 1804; the Crown is presently in the Cathedral of Monza. No doubt, this is the most important enamelled object of this period. The Iron Crown, created over the 5th - 9th centuries, Cathedral of Monza. Despite we know for sure that Byzantine enamel was born c. 600 AD, the most ancient enamelled icons that have survived the pass of time date to the 9th century. The reason is that, by the end of the 8th century, the so-called iconoclastic crisis began, when the Greek Church was on the verge of a schism between the defenders of the traditional iconography and those who opposed it, persuaded that it was necessary to destroy any form of sacred imagery. Nevertheless, we have a few findings of cloisonné enamelling during this time from Georgia, presently exposed at the Museum of fine arts of Tbilisi, where we can also admire the Martvili and Khakhuli triptychs, dated to the 9th-12th centuries (source: Núria López-Ribalta). Georgia, in fact, is one of the few territories of Byzantine influence, which was not under the power of iconoclasm. In continental Europe, from the 8th to the 9th century, the importation of cloisonné works from Constantinople inspires the Frank and German goldsmiths to produce true works of art, mainly in the form of reliquaries. In France, noteworthy is the holy water stoup of Saint Maurice of Agaune, with Persian-style motifs. Some of the most interesting enamelled objects of the Ottonian period (887-1000) are those commissioned by archbishop Egbert of Trier (950-993). 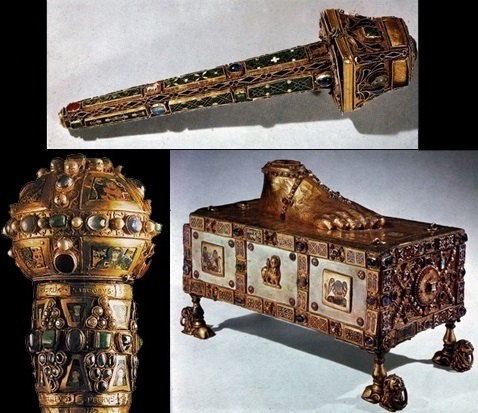 In particular, we mention here the Altar-reliquary of the sandal of St. Andrew, the Pastoral Staff of Saint Peter the apostle and the reliquary of the Holy Nail, presently in the Treasure of the Cathedral of Trier. The Italian laboratories also become soon very famous for the production of perfect Carolingian-style enamellings, who export throughout Europe in the course of the 7th century. An important witness of late-Carolingian art is the Altarpiece of Saint Ambrose in Milan, created about 850 by great German-born goldsmith Volvinius. Byzantine-style cloisonné from the Altarpiece of St. Ambrose in Milan (850, goldsmith Volvinius). In Spain, where the Visigoths and Vandals found their Germanic kingdoms during the 8th century, enamel works arrive from Byzantium and a new local goldsmith school flourishes. With the earliest Islamic-Iberian kingdoms (711-718), this production is temporarily on hiatus. Enamel jewellery finds a new fertile terrain one century later under the Caliphate of Cordova. In 839, during a memorable ceremony witnessed by the contemporary chroniclers, the caliph of Cordova ʿAbd ar-Raḥman II received a delegation of the Emperor of Constantinople. During this event, the Eastern Emperor offered many gifts to the caliph, such as golden jewels with Byzantine enamels. The new exchanges with the Byzantine goldsmiths reintroduced the enamel jewellery art to al-Andalus. For religious reasons (the medieval Moslems believed that working and trading precious metal was a form of usury), the Islamic customers delegated the production of enamelled jewels to the Jewish goldsmiths, so that they acquired a sort of monopoly in this field. This goldsmithing tradition will influence the Christian production in the Reign of León, in particular the school at the Abbey of Saint Dominic of Silos (we will return on this point in the next chapter on the medieval schools). One of the rare examples of enamelling in Christian territory is the Victory Cross, commissioned by king Alphonsus III in 908 and a symbol of the modern Principality of Asturias. A separate case is the formation of a goldsmithing tradition in the Kingdom of Navarra, where enamel had already arrived from Central Europe with the typical traits of Carolingian art. Still in the 9th century, we can find one of the most unique pieces of figurative art in England, an object with no equals in the Anglo-Saxon production: the so-called Alfred Jewel, named after Alfred the Great, king of Wessex (849-899) and found in North Petherton, Somerset. It is believed that this prestigious jewel was one of the handle of a pointer stick for reading, sent as a gift by Alfred to the bishops of England together with a copy of the Liber Regulae Pastoralis of Pope St. Gregory the Great. 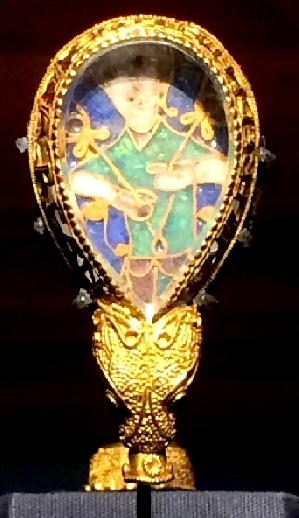 The Alfred Jewel, 9th century, England. Cloisonné enamel. Ashmolean Museum in Oxford. The Golden Altarpiece in St. Mark Cathedral (Venice) represents the most relevant product of Byzantine art, both for beauty and dimensions. Initially commissioned by doge Pietro Orseolo I (976-978) as an antependium and later enlarged, restored and adapted into an altarpiece by the will of his successors Ordelaffo Falier (1105), Pietro Ziani (1209) and Andrea Dandolo (1342). Today, the “Pala d’Oro” contains 250 plates with cloisonné enamel icons, created by Byzantine goldsmiths and/or raided in Constantinople during the Crusades. Pala d'Oro in St Mark Cathedral, Venice, cloisonné enamel, 10th-15th century, 3.84-1.40 m.
It is a common opinion of the historians that the success of Ottonian figurative enamel – similar to those of Byzantine origin – is to be linked to a precise date: April 17th 972, when Theophanu, empress of Constantinople, married Octo II, Holy Roman Emperor. It is well known, in fact, that the new empress called many artists, architects, artisans and goldsmiths from Constantinople to the court of Saxony. The new Byzantine taste easily triumphed also in the West, merging with the Carolingian and Ottonian figurative style, marking a new golden age for Western enamel. The Holy Crown of Hungary needs a separate mention. 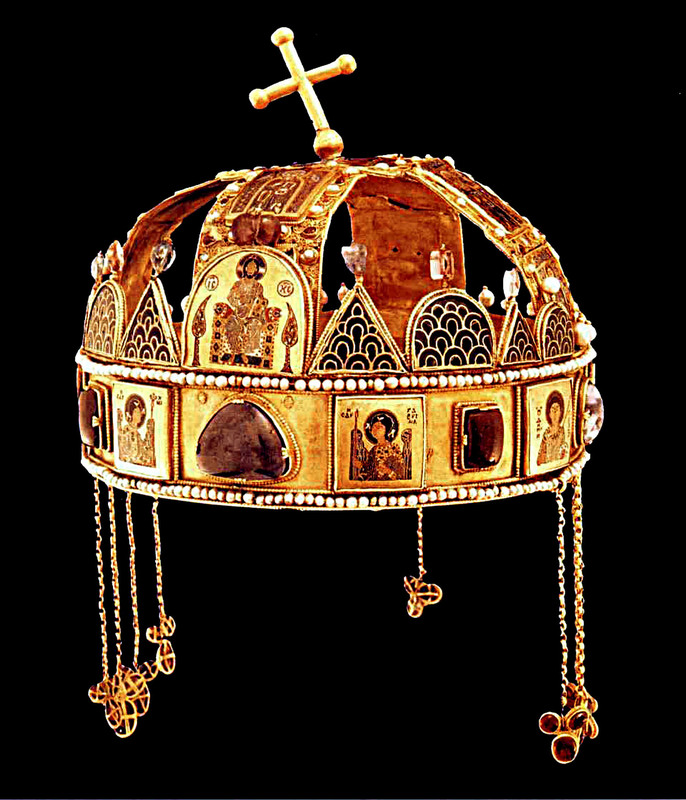 Legendarily created at the pope’s orders for the crowning of King St. Stephen of Hungary on December 25, 1000 (exactly 200 years after Charlemagne), in reality the crown is the union of two separate diadems, both with enamelled icons, one with Greek and the other with Latin inscriptions, both datable to the 11th century. The Crown of St. Stephen is said to be the most noteworthy example of émail mixté, a hybrid between cloisonné and champlevé. During the Carolingian period, we can witness the appearance of Gothic cathedral glass, where the glass was either coloured or enameled and assembled in tesserae, joined with each other with a lead frame. Stained blass was born. The most ancient example of stained glass was hand-painted in the 10th century by the monk Wernher for the Tegernsee Abbey in Bavaria. In Spain, under the patronage of king Fernando I, King of Léon (1016-1065), and his consort Queen Sancha, many workshops are born, dedicated to cloisonné on gold and silver; most of them are presently part of the Treasure of St. Isidore of Léon in the Cathedral of Oviedo. A curious example of iron-based objects: a religious image and a few discs, probably used as currencty. Cloisonné technique, 11th century. Found in the Haute Vienne. Museum of Fine Arts, Limoges.